Everything you need to know (and what to expect) when visiting a traditional highland games event. Chapter 1 - What are the Highland Games? Chapter 2 - When are the Highland Games? The Highland Games are one of the most iconic parts of Scottish Culture; the traditional games date back to as far 2000 BC. 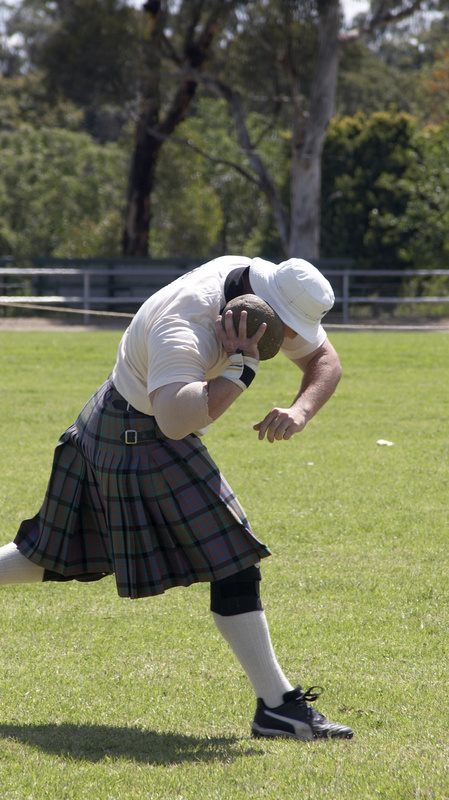 Much like the Olympics in Ancient Greece, the Highland Games are an opportunity to demonstrate your skill and strength in competitive athletics. The Games take place against one of the most beautiful backdrops in the world and offer an exciting time for all involved; whether you’re spectating or taking part, the Highland Games are a chance to experience the heritage of Scotland in a traditional manner. When are the Highland Games 2018? There are nearly 100 different games to choose from this year - take a look at the calendar below to find out what’s happening. Not sure what the Highland Games are? The rest of this guide will have you an expert in all things athletics in plenty of time for your trip to Scotland! 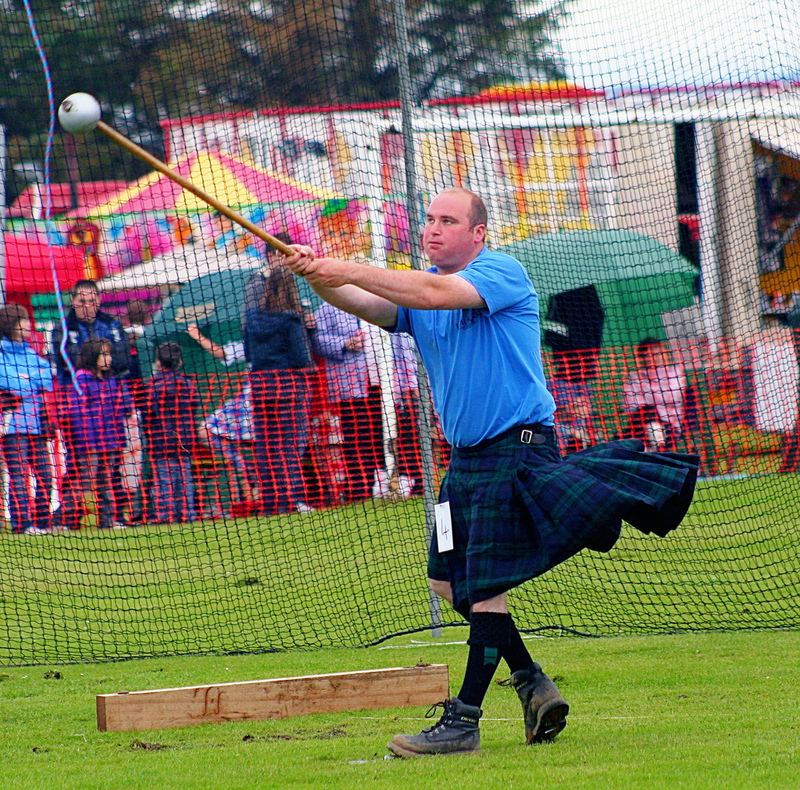 What traditional events make up the Highland Games? Heavy athletics, as they’re known, make up the main entertainment at a Highland Games gathering. They were invented by warriors who, when not in battle, needed a way of training, staying fit and boosting morale. They would compete between themselves using everyday objects and implements to keep themselves strong. A Caber is long tapered wooden pole used and is usually made from a Larch tree. Cabers can be upto 20 feet in length and weight 120-175 lb (54-79 kg). What happens at a Caber Toss event? This event started as a strength competition among woodmen to see who could turn the biggest tree over. They would start with trying to throw a large tree that was gradually shortened until someone tossed it successfully. Today the Caber Toss is a highly competitive event at the Highland Games and the main objective is to toss the caber in the straightest possible line away from the thrower. Distance is unimportant. The competitor who tosses the caber in the straightest line (that is closest to 12 o'clock) receives the highest score and is declared the winner. 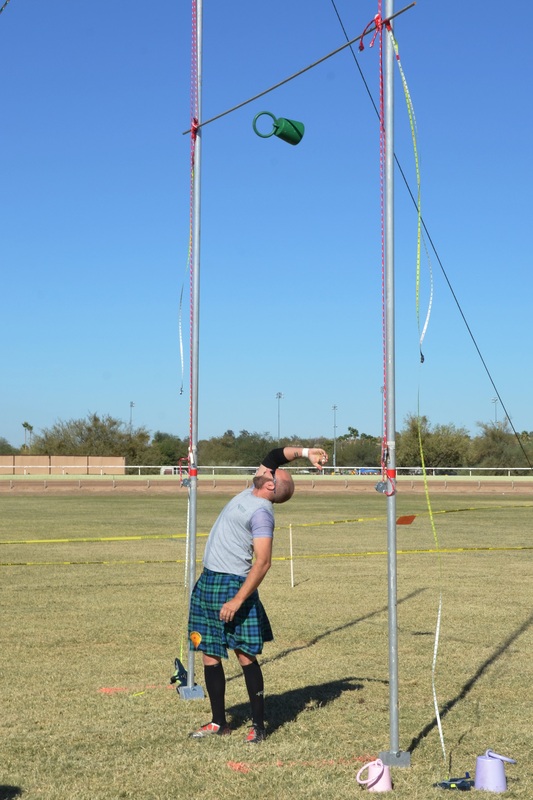 What is the technique of a Caber Toss? 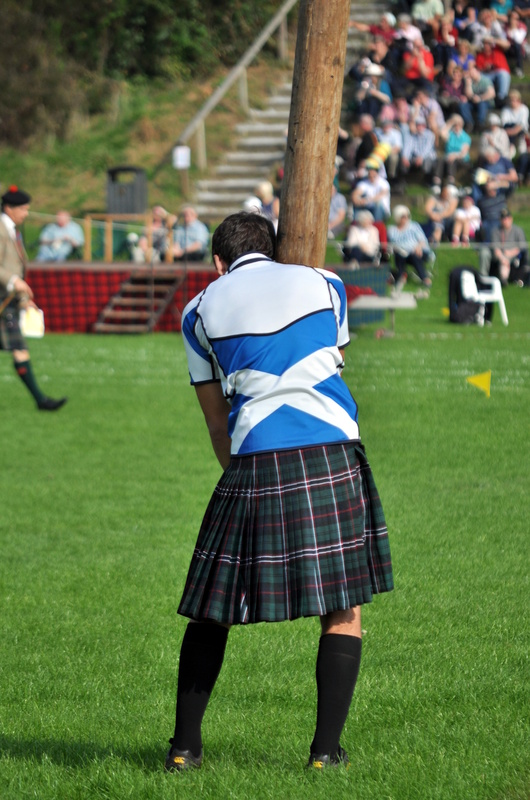 The competitor must pick up the caber and balance it upright against the shoulder and neck with the tapered end downwards. However, getting to this point is the difficult part. Aided by other competitors or stewards the caber is walked upright, then the competitor crouches down, sliding their hands down to the base of the caber, they then lift from underneath the bottom to raise the caber. The competitor then runs forward a few paces with the caber to gain momentum and thrusts upwards to flip the caber so that the larger end rotates and strikes the ground first. 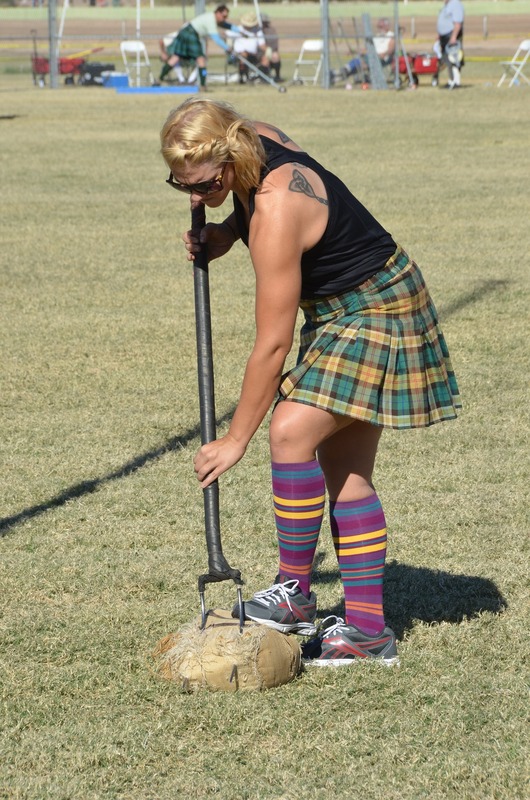 What is the Hammer in the Hammer Throw Highland Games event? The Hammer is a round metal ball attached to a shaft made from wood, bamboo or plastic. The metal ball weighs between 16-22 lb (7-10 kg) for men and 12-16 lb (5-7 kg) for women. What happens at a Hammer Throw event? With their feet firmly fixed in a position, the competitor rotates the hammer around the head and then releases the hammer over the shoulder. Competitors are allowed to wear special footwear to help fix their feet in position and help to balance and generate power and distance. The competitor who throws the hammer the furthest distance is the winner. What is a Stone Put event? Stone put events are very similar to the modern day shot put events although real stone is often used instead of a steel ball. The weight of the stone will range from 16-26 lb (7-12 kg) for men and 8-18 lb (4-8 kg) for women. There are two type of stone put events, Braemar Stone and Open Stone, and each has their own allowable technique for throwing the stone. In the Open Stone version of the stone put event, athletes are allowed to use any style as long as the stone is thrown with one hand and rests on the neck until release. The weight of the stone for this version of the event is 16–22 lb (7-12 kg) for men and 8–12 lb (4-5 kg) for women. The Braemar Stone version is a standing put, so no spins or run up to the toeboard are allowed. Weights for the Braemar Stone event are typically 20–26 lb (9- 12 kg) stone for men and 13–18 lb (6-8 kg) for women. A sheaf is a bundle of straw wrapped up in a burlap bag. For the sheaf toss event the sheaf weighs 20 lb (9 kg) for the men and 10 lb (4.5 kg) for women. What happens at a Sheaf Toss event? Competitors us a pitchfork to toss the sheath over a high horizontal bar. They get three chances to throw the sheaf over the bar and if they succeed, they progress onto the next height. The competitor who has hurled the sheaf the highest is declared the winner. The sheaf toss is not a traditional Highland Games event, however, its popularity means that the sheaf toss has now become one of the main events at the modern day games. How heavy is the weight for a Weight Over The Bar event? The size of the weight varies depending on what class the competitors are in. Male athletes throw a weight of 56 lb (25 kg) and female athletes throw a 28 lb (13 kg) weight. What happens at a Weight Over The Bar or a Weight For Height event? In a test of strength, competitors throw the weights over a high horizontal bar. Each competitor has 3 attempts to clear the height and if successful, they move onto the next height. The competitor who throws the weight the highest, wins. What is the Weight Over The Bar technique? The weights have a handle attached and the classic technique for competitors is to swing the weight between the legs before pulling the weight up with as much power as possible directly overhead. The unorthodox technique involves the athlete spinning to gain momentum and releasing the weight from the side. This is not allowed at some Highland Games gatherings. How heavy is the weight in a Weight Throw event? There are two separate weight throw events. In the lighter event, male athletes throw a weight of 28 lb (13kg) and female athletes throw a 14 lb (6 kg) weight. In the heavy event, male athletes throw a weight of 56 lb (25 kg) and female athletes throw a 42 lb (19 kg) weight. What happens at a Weight Throw event? Competitors throw the weights with one hand only from the throwing area (4.5 feet by 9 feet) behind a toe board or trig. Each athlete has 3 attempts and the longest throw wins. What is the Weight Throw technique? The weights are metal and have either a handle attached to them directly or a chain and handle. The classic technique for competitors is to spin or turn to gain momentum before releasing the weight. What happens at a Maide-leisg event? This is a strength event performed by two competitors sitting on the ground face to face with the soles of their feet pressing against each other. Both people hold onto a stick in-between each other with their hands. The competitor who has the strength to lift the other from the ground is declared the winner. Bagpipe music plays a major role at the Highland Games gatherings; of course it does, this is Scotland after all! 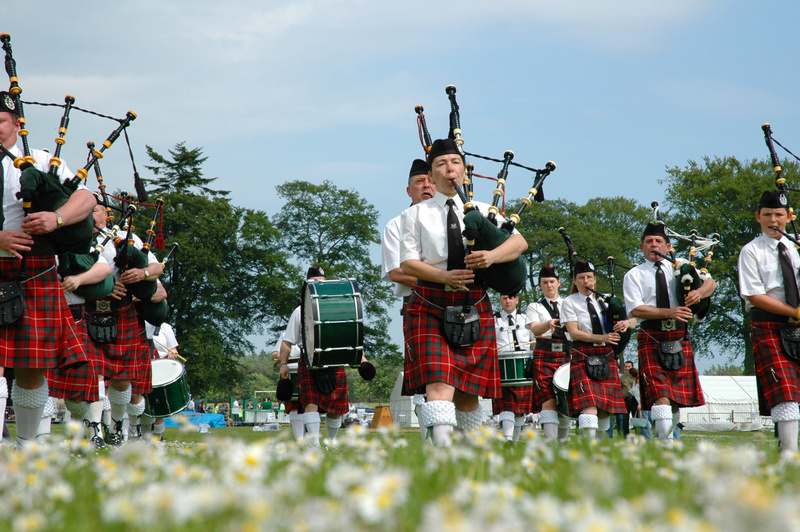 The 'massing of the pipe bands' is usually held at the opening and closing ceremonies of the games where 20-plus pipe bands will play and march together. It’s always an amazing spectacle and you should expect to hear a collection of traditional music performed, such as Scotland the Brave. As well as the massing of the pipe bands, there are also other amazing piping and drumming competitions to watch, including solo performances through to small groups and bands. As well as bagpipe music you will hear celtic bands, plenty of fiddling and the odd harp circle. At modern-day Highland Games gatherings you can expect to see plenty of Highland dancing. Developed in the Scottish Highlands as early as the 19th and 20th centuries, Highland dancing is a technical solo style dance that has developed into a competition during the games and now recognised as a sport by sportscotland, the national agency for sport in Scotland. Fact: Highland dancing competitions used to be an all-male event. The first women started to enter in the late 19th century. Competitive Highland dancers often dance solo and require technique, strength and stamina; performing on the balls of their feet, dancing not only involves a combination of steps but also some technical upper body, arm, and hand movements. Highland dancing is mainly performed to Highland bagpipe music. You may be aware of famous Highland dances such as the ‘Highland fling’. The Cowal Highland Games Gathering hosts the annual World Highland Dance Championship and attracts the best competitive dancers from around the world. What else can you expect to see and do at the Highland Games? There is a wide variety of Scottish-related goods and produce to be found at each gathering with numerous clans selling their unique products with their own specific tartan pattern. 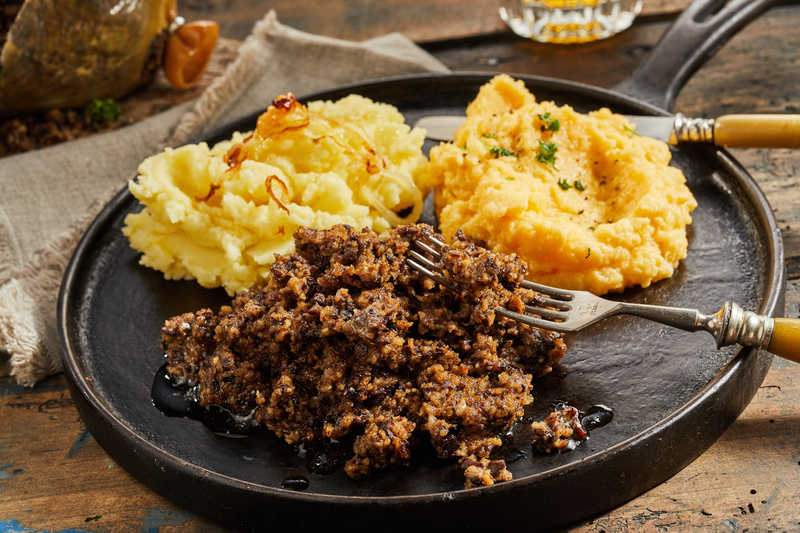 As well as the clans you will find many vendors selling traditional Scottish food and drink such as Pies, Bridies (meat pastry/pastie), Scotch Eggs, Haggis, Neeps and Tatties and of course, plenty of Irn Bru. 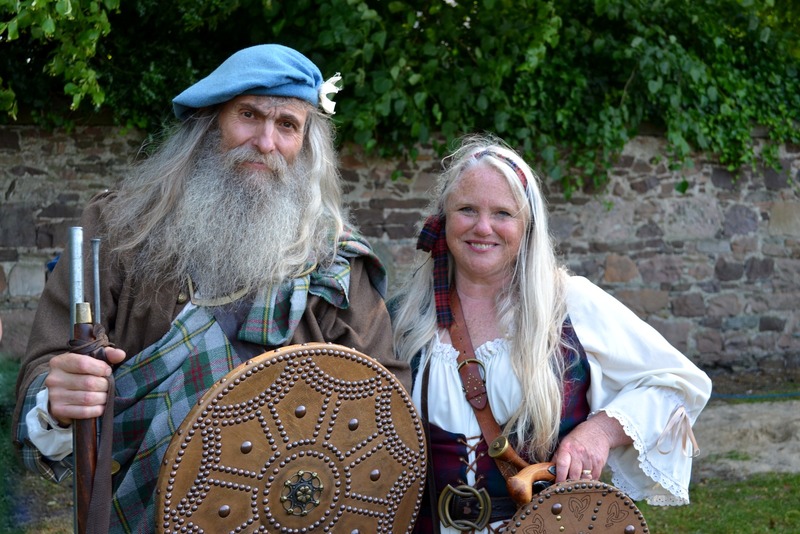 Want to visit Scotland and see a Highland Games event? We hope you've enjoyed our guide to Scotland’s Highland Games events and maybe it has inspired you to visit Scotland. If you're looking for somewhere to stay during your visit, we'd love you to check out our 5 wonderful holiday parks in Argyll, we're well positioned for day trips to several Highland Games gatherings around Scotland.